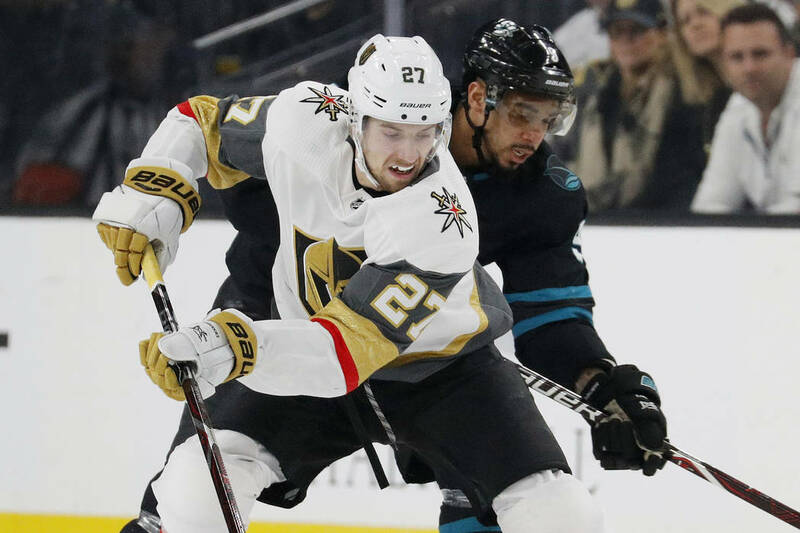 The Golden Knights can prevent San Jose from clinching a playoff berth when they face the Sharks on Monday at SAP Center. The Golden Knights complete their back-to-back Monday when they play the San Jose Sharks in a potential postseason preview. Opening faceoff is 7:30 p.m. at SAP Center, and the game will be televised on AT&T SportsNet Rocky Mountain. The Knights (40-27-5, 85 points) have won eight of their past nine and sit nine points behind the second-place Sharks in the Pacific Division with 10 games remaining. The teams would meet in the opening round of the Western Conference playoffs if the current standings hold. Coach Gerard Gallant said following Sunday’s 6-3 victory over Edmonton that goaltender Marc-Andre Fleury will not make the trip to northern California. Fleury remains day-to-day with a lower-body injury. The Knights did not have a morning skate Monday, and no lineup information is available until Gallant meets with the media two hours prior to the opening faceoff. Malcolm Subban improved to 12-1 in his career at T-Mobile Arena with 16 saves against the Oilers and could draw his second consecutive start to finish the back-to-back. He is 1-0-1 with a 1.46 goals-against average and a .957 save percentage in two appearances against San Jose lifetime. Maxime Lagace was recalled from the American Hockey League on an emergency basis Sunday. “They’re going to get a good goaltending performance regardless of who they put in there,” Sharks coach Peter DeBoer said. Marchessault tallied two goals Sunday to tie Max Pacioretty for the team lead with 22, and five players scored in the victory over Edmonton. Right wing Mark Stone had his 31st goal and extended his points streak to five games (3 goals, 3 assists). San Jose (43-21-8, 94 points) can clinch a playoff berth with a victory or overtime/shootout loss. The Sharks fell 4-2 to Nashville on Saturday and have lost two straight in regulation at home for the first time all season. Goaltender Martin Jones is expected to start and is tied for second in the NHL with 34 victories, one behind Fleury. Defenseman Brent Burns has a team-high 74 points and is the second defenseman since 2008 with 60 or more assists in a season, joining current teammate Erik Karlsson. Timo Meier became the third Swiss-born player in NHL history to record a 60-point season with his goal against the Predators. DeBoer said there were game-time decisions to the lineup against the Knights, which could include forward Joe Pavelski. The team’s leading goal scorer with 37 took a hard hit Saturday and did not take part in San Jose’s optional skates the past two days though he was projected to play. Karlsson, sidelined since Feb. 26, skated on his own for the third straight day prior to practice but was ruled out for the week by DeBoer. The teams play again March 30 at San Jose.